Mark Goodfellow, Alcoa union leader, speaks during the governor’s announcement Thursday of a new state deal for the company. MASSENA – Gov. Andrew M. Cuomo visited Massena today to announce that an agreement has been reached with Alcoa that would preserve 450 jobs at the aluminum company's smelting plant. The new seven-year agreement is subject to approval by the New York Power Authority Board of Trustees, and Governor Cuomo is recommending the board vote in support of the proposed deal at its meeting on March 26, said a press release from the governor’s office. The new contract provides Alcoa with a 240-megawatt low-cost hydropower allocation from NYPA's St. Lawrence-Franklin D. Roosevelt Power Project through 2026. The power rate is indexed to the price of aluminum and will increase or decrease depending on the market price of aluminum. The new agreement, between Alcoa and the New York Power Authority, extends the previous contract, which expires at the end of the month, through 2026. That contract had included the protection of 145 jobs that are now supported by Arconic, which separated from Alcoa in 2016 but maintained operations at the same site. Mark Goodfellow, Alcoa union leader, also spoke during the announcement and credited the governor’s leadership in securing the contract. Goodfellow said the state had once again delivered for the region. "We are pleased that this deal could be reached and are grateful to the many hardworking and dedicated employees and their families who make the company what it is and the community a special place to live," said State Sen. Joseph Griffo, 47th district which includes Massena. State Sen. Patty Ritchie who represents Ogdensburg and other towns in St. Lawrence County said, "I want to applaud the New York Power Authority and Alcoa for coming together to reach this agreement—which is a victory for the local workforce and the regional economy. Alcoa has a great history in the North Country and protecting its future in Massena is a win-win for our entire region." 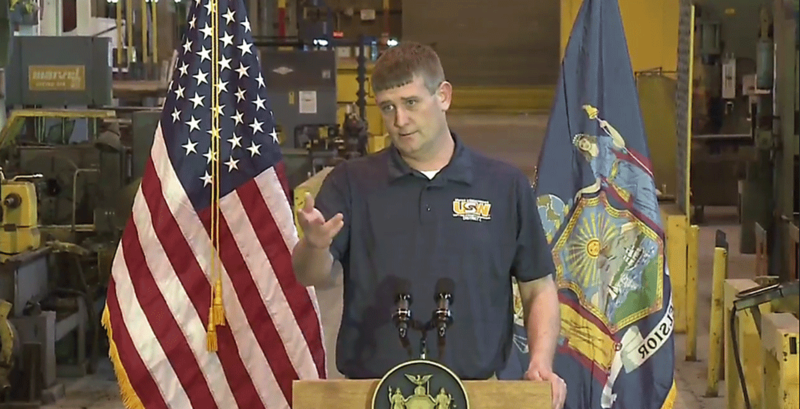 "I'm thrilled with the leadership shown by NYPA, the Governor and Alcoa in coming to an agreement that will be a critical investment for the future of Massena," said Assembly Member Mark Walczyk who represents the River District. Alcoa signed its original contract with NYPA in July 1955, more than three years before the St. Lawrence-FDR project—the Power Authority's first generating plant—began producing electricity. In December 2018, the governor announced that Arconic would maintain its workforce through 2028, ensuring a commitment of roughly 600 jobs total at the smelting facility. "This agreement announced today secures hundreds of jobs at Alcoa, continues the upward momentum of the North Country and builds on New York's thriving economy," Governor Cuomo said. "Alcoa has once again committed itself to Massena for the long-term through this hallmark agreement, which will protect its workers and the state investments made to the region and the facility for years to come." He acknowledged that the state had turned a “blind eye” towards the North Country in the past and that the economy has suffered as a result. "Alcoa is pleased to have reached an agreement with NYPA that provides the Massena smelter with competitively priced energy for the next seven years," said Tim Reyes, president of Alcoa Aluminum. "While the global aluminum industry faces numerous challenges, securing competitive and reliable power is essential for supporting the facility's future. We thank Governor Andrew Cuomo and U.S. Senator Chuck Schumer for their support during this process and NYPA for its continued cooperation." This is the latest in a long line of state bailout deals for the aluminum giant. The Alcoa deal announced Nov. 24, 2015 granted the Alcoa $30 million from the New York Power Authority in power discounts and $43.6 million from the state. Alcoa had said on Nov. 2, 2015 it would curtail operations at the smelter at its Massena West plant, which would have eliminated at least 487 jobs, leaving about 217 positions for other functions at the plant. Under the Nov. 24 agreement, Alcoa was required to employ a total of at least 600 full-time equivalent employees – those working at least 35 hours a week – throughout Massena West. The company offered a voluntary retirement package to eligible employees, according to a November 2015 statement from Cuomo’s office. Alcoa’s bailout includes a hefty NYPA electricity discount, in addition to millions of dollars in discounts and incentives Alcoa has already received from the agency. The 2015 deal is the latest in a long series of incentives offered to the company in exchange for maintaining jobs at the facility. On multiple occasions, Alcoa has failed to live up to promises made in previous agreements. According to a March 2014 news release from the governor's office, the company promised to maintain 750 jobs at the west plant and provide training for the east plant's future workforce, once a promised $600 million modernization of the Alcoa East plant was underway. That plan was dropped. In summer 2013, Gov. Cuomo was quoted as saying 1,000 jobs would be guaranteed under a deal that had been struck with Alcoa. However, the 2015 deal includes up to $40 million in financial penalties should the company breach its commitment to maintain at least 600 jobs, or close the plant before the contract expires March 31, 2019. The 2015 coporate welfare package was announced after Alcoa made public plans to layoff 487 employees.